A Sprag Clutch is a free-wheel device having an inner race, and an outer race either of which can be the input or output member. The input member can be arranged to drive the output member in a chosen direction and permit the output member to over-run in the same direction. In general, Sprag Clutches are able to transmit greater torques, within given overall dimensions, than other types of free-wheel device. A Sprag Clutch is a free-wheel device having an inner race, and an outer race either of which can be the input or output member. The input member can be arranged to drive the output member in a chosen direction and permit the output member to over-run in the same direction. 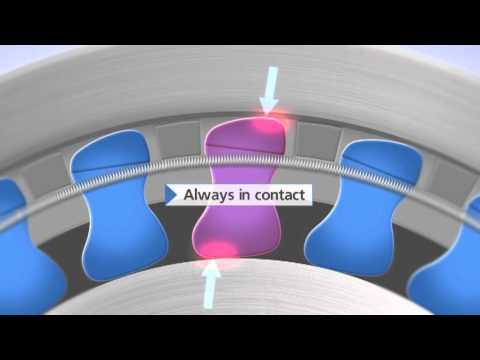 A short video showing the operation of Renold Sprag Clutches.